Is Atlanta Done With Sprawl? The sprawling-est city in the Southeast — Atlanta — is entering a whole new phase, according to a new report from Christopher Leinberger at the George Washington University School of Business. Since 2009, the bulk of for-profit development in the region has been located in walkable regional destinations that account for just 1 percent of region’s land area. 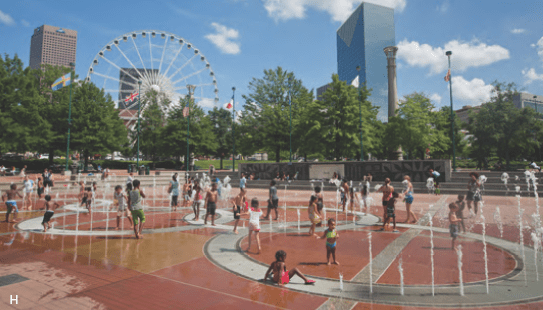 These walkable centers — “WalkUPs,” Leinberger calls them, for “walkable urban places” — snagged a whopping 60 percent of the new profit-making development that has occurred in Atlanta after the real estate bust. Leinberger acknowledges that most of the region remains drivable sprawl — and those areas will likely continue to be relatively stable and prosperous. But there is no longer any pent-up demand for those kinds of places. The untapped market is for walkable places with major civic or cultural amenities — the kinds of places that are “regionally significant.” And developers are responding to that. In Atlanta’s “WalkUPs,” for example, office rents are 30 percent higher than the region as a whole, the study found. Retail in these areas rents at a 144 percent premium. Meanwhile, rental housing in WalkUPs fetches 12 percent higher rents, while for-sale housing was selling at a 161 percent higher price per square foot in walkable destinations. 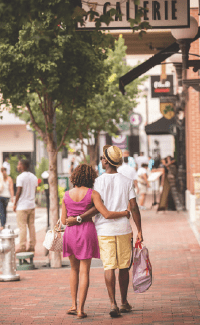 There are only 27 of these “WalkUPs” in the Atlanta region, places like downtown Decatur — a walkable, inner-ring suburb — or the campus of Emory University, according to Leinberger. But there are also nine emerging WalkUPs: places that were developed for cars but are making a conscious transition to become walkable places. So while the good news is that the Atlanta real estate sector seems to be responding to changing consumer preferences, the bad news is that these areas combined account for only about 0.88 percent of the region’s land area. Nevertheless, Leinberger estimates that most of the economic growth that occurs in metro Atlanta in the coming years will take place in these centers. These areas already host 19 percent of the region’s jobs and roughly 27 percent of knowledge industry positions. But poor investment in transit is holding the Atlanta region back, Leinberger says. Only 59 percent of WalkUPs in the Atlanta region are served by its rail transit system, MARTA, compared with 88 percent in the DC region. DC’s Metro rail system is about 2.5 times the size of Atlanta’s, despite the fact that they were the same size in the 1980s. As a result, MARTA has a reputation for serving mostly poor people, while DC’s Metro ridership is a much better reflection of the total population. That is part of the reason why office rents in DC fetch a much higher premium when they are in WalkUPs that are transit accessible — 75 percent — compared with Atlanta’s 30 percent. Nevertheless, the bulk of new development in Atlanta’s existing and emerging WalkUPs — 85 percent — went to locations served by rail transit. To ensure economic success, the Atlanta region should increase its emphasis on developing walkable, bikeable, transit-friendly areas, Leinberger writes. “Walkable urban development calls for dramatically different approaches to urban design and planning, regulation, financing and construction,” he says. I’m dubious that GDOT and all the induced-development insiders (institutions and families) who have grown wealthy through expansive highway construction programs for Atlanta and elsewhere over the past century will be strongly inclined toward such a radical shift in objective focus in the short-term.